This waterfall was is of the hundreds of hidden gems when you get off the rim of the Grand Canyon and explore it by raft and by foot! 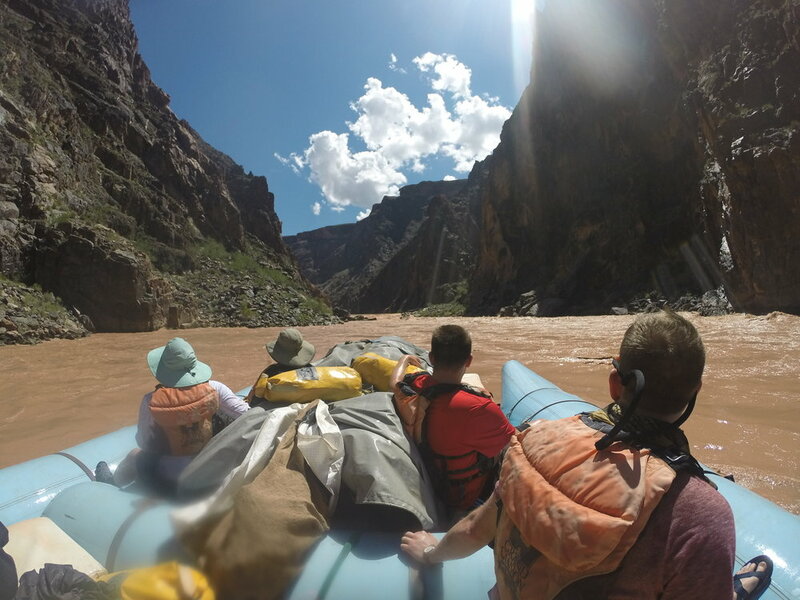 If you missed my post on the incredible journey it took to even get to WW Raft the Grand Canyon read it HERE! My two buds and I spent six days and five nights rafting, hiking, eating, and drinking our way through the Grand Canyon. It is a pilgrimage of sorts I believe for any true adventure traveler. To sleep on a cot next to the Colorado River and be woken only by the rushing water is an experience that is hard to put into words. I'll use just one word: GO. GO. 1. We used Grand Canyon White Water and Brock, Jake, Trevor, and Matt were incredible! I highly recommend them as the experience was top notch. 2. There are tons of trip options. We had a limited window but you can go for as short as a few days and as long as three weeks! The longer the better of course :). Both paddle and motorized trips are available. 3. No cell phone service no matter how hard you try. Sorry! 4. You will be DIRTY. Enjoy it. You will also be sweaty. Enjoy it! 5. The food is great and the companionship is even better. The beer is dented and lukewarm but no one ever seemed to mind. 6. Book in advance! These trips fill up and we booked ours about 10 months out. 7. If somebody from a different country said they liked Adventure Travel and what should they do on a weeklong trip to the states for the first time this might be my number one recommendation. It's that incredible of a trip! Within 30 minutes of being on the water we encountered an overturned raft. No one was harmed but we got to scale some rocks and help turn it back over. It took about 12 of us. This is highly unusual in a motorized raft but definitely happens! Views like this for hours every single day! Each day brought miles of side canyon hiking and exploration! Trevor leading us off with some amazing cliff jumping into the Colorado River! Bring what you can carry, adventure awaits! Like TLC we were chasing waterfalls. This experience as I said can't be put into words or correctly revisited on a blog. My only thought is "What are you waiting for?" Get this trip booked, you won't regret it! Questions? Been on this trip? Comments below please! Sign up in the footer for our EMAILS to WIN PRIZES!